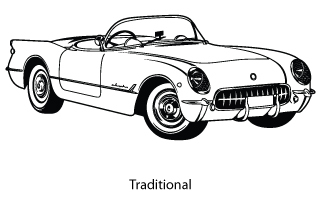 Vectorization is the process of redrawing logos in a format that can be output at any resolution. Whatever your industry is, whether you need multiple vector logos on an ongoing basis, or you only need one logo converted to vector, we have strategical business solutions that will make the process both economical and efficient. Our talented graphic artists can illustrate your photo portraits in one of four styles, to your specification. While there is an artistic quality to these styles, it is also especially usefull for types of printing that don’t lend itself well to continuous gradations, such as silkscreening and vinyl cutting. These files can be specially customized for your specific needs. Click here to request a quote to commission a vector portrait. Our artists can create black and white lineart illustrations from virtually any photograph. These illustrations are especially popular with engravers. Have a file, but it’s not in a format you can open it in? Perhaps you have the right program but the file was saved in a newer version. Or perhaps you have the right version of the right program to open the file, but the file has been corrupted. And you need it right away? Whatever your platform may be, we have quick and thorough solutions at a minimal cost.